We’ve all seen it. Instagram makes some changes, and your biz feeds are full of people freaking out about how Instagram is OVER, RUINED, THE WORST. Eventually, people adjust to the new normal, and the stressed-out updates die down until the next update. Look, I’m not going to lie, getting found on Instagram isn’t as easy as it was in 2014. Or even 2016. However, that doesn’t mean it’s over. Not by a long shot. Instagram’s star as an excellent channel for brands and businesses will continue to rise, so we need to work with the algorithm instead of complaining about it. Your Instagram bio is very precious real estate. Often treated as an afterthought, your bio is the first point of contact people have with your brand, their first impression. Your brand bio should be impactful, have personality, and compel people to take action. Make sure that it’s relevant to your target audience, the tone is brand-appropriate, and that you take advantage of things like custom hashtags you may have developed or points of difference (e.g., sustainability), play with emojis, and make sure you’re utilizing your website link! By clearly defining who your customer is, you can develop a consistent theme that makes people who fit that definition look at your feed and say to themselves ‘I belong in this space.’ That’s how you create loyal, engaged fans. A feed that’s chippy-choppy and inconsistent leaves followers feeling unsure about what you’re all about. Instagram has made their location features increasingly powerful over the past eighteen months. Even so, geotags are a feature that often forgotten despite being a useful tool for finding your target audience and get your content in front of them, too. By adding a geotag, you are attaching a location to an image or story, potentially putting your content in front of anyone who clicks that tag. When you click on a tag you have used, you can engage with others who have posted at that location to build your rapport with people you already know share an interest with your content. Tagging on Instagram Stories can be even more effective because fewer people are using geotags on Stories, but plenty of them will watch tagged content because the Story feed is at the top of every location tag feed. For example, I was in Lake Tahoe recently, and I tagged my stories with our location, and there was a significant spike in views and engagement with my Stories. By using geotags to place your content AND to find new people to engage with, you’ll be ensuring your content reaches a broader audience that’s primed to view your content. Instagram hashtags remain essential to reaching people with your content. Posts that have a single hashtag perform 12.4% better than those with no tags. That will add up when you use all 30 tags! Take a look at what tags your competitors are using to learn which tags are driving the most genuine engagement with your ideal audience. Take a look at what tags your audience are using AND what content engages them. Using tags that your audience isn’t is not going to build your following or engagement. Niche down - using broad tags like ‘happy’ is a recipe for burying a post in the hashtag's feed within minutes. Instead, find community tags that relate to your niche because that’s where the authentic action will be. Use a service like Later or Instavast to research related tags that can broaden your reach. Many things have changed with Instagram, but one thing remains true: hashtags are an essential and useful part of your overall growth strategy on the platform. 5. Become A Vertical Video Star! 2019 is the year of vertical video. Vertical video might not be new, but now it is growing up and ready to take center stage. To keep up on Instagram, creating vertical video content for Stories and IGTV (especially if you have a personal brand) is going to be vital to staying ahead of the pack this year. The first 3 seconds matter - when moving on is as easy as a finger swipe, you have to capture attention fast. Make sure that your video packs a punch from the start. Use your smartphone! Not only is this available to anyone using Instagram, but it’s also straightforward to shoot video in the 9:16 format required for vertical video. Learn how to edit fast with CutStory or Magisto to deliver a dynamic, creative experience to your audience. Video can feel overwhelming, and the vertical format might not be something you feel comfortable with, but it is absolutely worth starting to experiment and learn now because vertical video isn’t going anywhere! 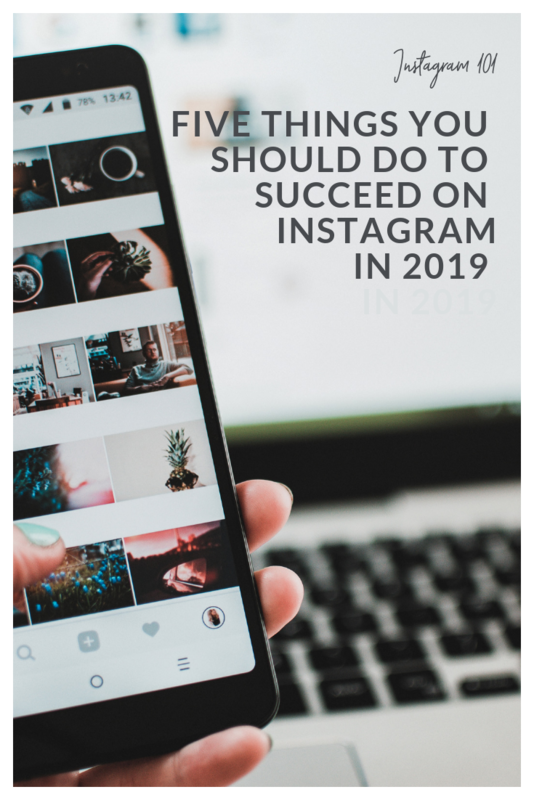 Continuing to grow your Instagram following in 2019 might take some elbow grease, but increasing your reach and influence on the platform is entirely within range with the right plan of action.